The year I wrote this book I had a delightful boy in my class called Fred. We had some animals visit the class, and by chance the ferret was named Fred and the iguana was named Fred. We all thought that was very funny, and I told Fred that the next time I wrote a book my main character was going to be called Fred. I don’t think he thought it was going to be a girl. People ask me if I’m Miss Agnes which startled me at first,since it had never occured to me that anyone would think that. I hasten to say no, I’m not anything like her. There was a real Miss Agnes. When I was a teenager I met a teacher on the banks of the Koyukuk, and she gave me a peek into her little log school. Her name was Agnes Schlosser, and I couldn’t have talked to her for more than five minutes. But she stayed in my mind for all of those years, and I often thought of her when I became a village teacher myself. I have no idea what kind of teacher Agnes Schlosser was or what kind of person, so I made all that up, but she was in my mind a representation of all those dedicated teachers in the old days, single women for the most part, who lived for their students. The kids in this book are all someone I taught or–in the case of Marie–an old friend. I always use real people and real events because there are so many unique village people to remember and so many mind-boggling stories to preserve in print. Every incident, every character, comes from something that really happened, someone I knew. But the only real names I’ve used in Miss Agnes are Sam White, the pilot, and Bobby Kennedy. I don’t know why I felt they had to have their real names, but then I seldom know why I do anything when I’m writing! I wrote Miss Agnes in eight hours, on a spring break, because I took a sudden notion to experiment with first person. It sounds strange, eight hours, but since everything was from memory–I was 10 in 1948, like Fred–and since I had a classroom like that, there was no research, no thinking anything out. I just wrote. When I finished I put it on the hard drive and forgot about it until I got broke and thought I’d better sell another book. And she’s been a joy, Miss Agnes, because of the letters I’ve gotten. I’ve saved all of them, and someday I’m going to read them all again. 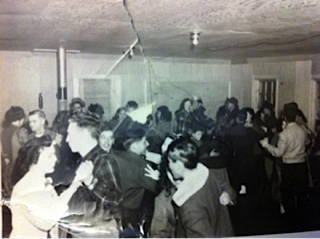 This is a dance in a Koyukuk River village at winter carnival time –Huslia or Huges, I don’t know which. About 1955. That’s me in the plaid jacket dancing with Frankie Simon. I read The Year of Miss Agnes a few years ago when I started reading. Although I originally read it because my name is Agnes now it is one of my favorite books. I did not know it had a sequel til I saw it hear now I am hunting for it. I am eleven now and The Year of Miss Agnes is still one of my comfort books, thank you for writing it. I first read The Year of Miss Agnes a few years ago when I started reading. Although I originally read it because my name is Agnes, it is now one of my favorite books. Even now that I am eleven. I did not know it had a sequel till today when I looked you up. I don’t have the words to thank you for all the pleasure your stories have given me. This June I will be seventy. I’m an old man now. But I’ve been reading children’s books since I was nine years old, in 1952. When I was twelve I began reading adult books, but I never stopped reading children’s stories … not even when I grew up and married and had children of my own. Then I simply read aloud to them and used them as an excuse for buying more children’s books. “This for my kids,” I’d say as tried to hide my excitement at the thought of starting a new Zilpha Keatly Snyder mystery, or Tucket’s Travels by Gary Paulsen. Thanks again, sincerely. Your stories move me and bring back memories of my own time in Alaska as a young man. Oh Don, what a lovely letter. Not only are you almost seventy, but an ex-Alaskan. I will be 75 and I finally realized that all my books are in the Grandma Moses mode. I just want to “save” the old days in some way. Now I’m writing a series about the sort of mining camps I was raised in, and though I have to admit I’m romanticizing a bit-( I remember a lot of grim stuff I’m not putting in these books)-I’m pleased to be showing this old good world to kids today. I actually can’t believe they’re going to print it, but there’s a lot about publishing I don’t understand. Actually I don’t understand any of it! Thanks so much for writing. You made my day. I read The Year of Miss Agnes several years ago to my children and it’s remained one of their favorite books. I’m planning to read it to my younger children soon. In Chapter 3 you mention pictures on the wall. “They weren’t pictures of real things, but they were just lines and squares and shapes of bright, bright colors all put together…but really happy somehow.” I’m wondering if you had any particular artist(s) in mind when you wrote this. The first artist I thought of was Wassily Kandinsky. Because I’m homeschool and write Literature Kits based on my favorite books, I like to explore with my children various topics/subjects discussed in the stories and I would like to introduce an artist to my kids and have them do an art project inspired by the artist. 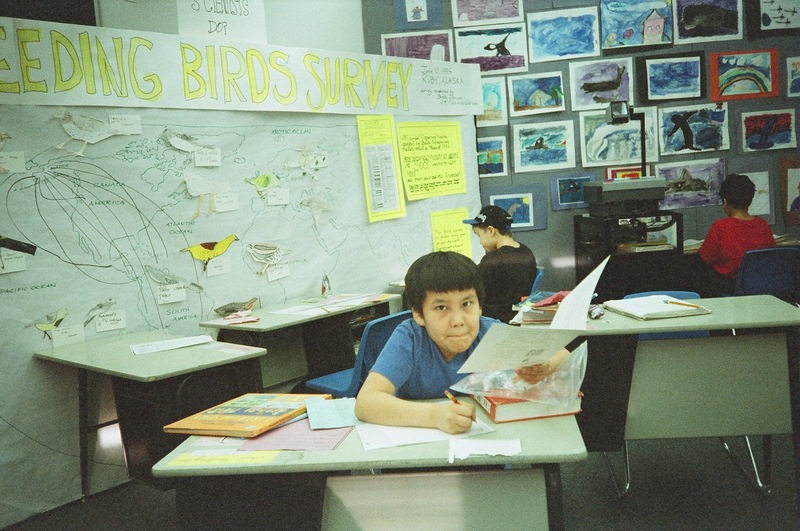 Marla, your letter made me want to sit down and have a long talk with you..art education is one of my favorite things. I could have been thinking about a dozen artists when I wrote that paragraph in Miss Agnes..Paul Klee is one of my all-time favorites and it’s easy for kids to imitate him because he was imitating kids! He thought children were natural artists and that adults lost that talent. I teach my grandchildren art when there’s time, and they’ve liked Miro, Kandinsky, Delaunay,Matisse…along with dozens of more representational artists. I’d love to see your literature kits. I’ve been exploring art for children on the internet and I’m nearly drunk with all the new artists I’ve come across. Wish there was more time to teach art! I homeschooled all my kids, and now am teaching my granddaughter. I can tell you enjoy it as much as I do.Thanks for a fabulous letter. Where are you? Write again if you come up with something great I can borrow from you! Thank you for your quick reply. So fun that you homeschooled your children too! A couple of times I’ve placed my children in regular public school and/or charter schools and I always end up removing and homeschooling them again. I live in the Central Valley of California not far from Sacramento, very different from Alaska, but full of history also. At one point we lived in a rural area of Wisconsin not far from an Amish community, which was also enjoyable. Even though I’m in my mid-40’s I was homeschooled for two years while my parents were missionaries in Austria. My second year–when I was 12 and 13–I was left to my own devices because my mother had health challenges. I had a math tutor, but the rest of my text books were outdated (over 30 years old). That year I never had a test or quiz. My homework was never checked. I spent the majority of my time reading everything available in the tiny library at the missionary base. Because we lived in a Cure Hotel that had been owned by a Jewish family before WWII and had been taken over by the Nazis and used as their headquarters, I became fascinated by World War II and European history from that time period. I devoured biographies and historical fiction. I memorized the script for the Sound of Music. I wrote stories about the Jewish family that had lived in the my hotel. I can honestly say that I learned more during the two years I lived in Austria–despite the fact that my “formal education” had a few holes–than many of my other school years. Because of my background, I believe in Miss Agnes’ teaching style and love the book! P.S. I write my literature kits for my children, but also for an online homeschooling website–schoolhouseteachers.com. I’ll be finishing up the first wee of the literature kit based on your book in a day or so and it will be posted on the website by January 6. Because Alaska became a state in January 1959, I thought it would be appropriate. I forgotten to mention I would love to sit down and talk with you too! I started out as an Art Major, then switched to Communication Arts. I now, as I mentioned before, homeschool my children, write Literature Kits, and attempt to write children’s/Young Adult books. I finished a children’s book , but–because my agent wanted to represent YA authors and not children book authors–I haven’t been brave enough to send it to him yet. I also don’t feel like it’s quite finished. Last year, the entire third grade classes in our school district read The Year of Miss Agnes. I heard so many good reviews that I had to read it myself (I’m a reading tutor). Now some of my students are begging to read the sequel, as am I. Thank you for writing books that engage and inspire students to look beyond their own neighborhoods! We just finished reading your book A Year With Miss Agnes. We LOVED it! Some of our favorite parts were when they did the Christmas play and Miss Agnes took all their pictures. We thought it was funny that they had never seen a camera or a picture of themselves. We thought it was funny when they all pretended they were blinded by the flash. We also like reading about Bokko and how she learned to communicate through sign language, lip reading, and touch. We liked the part about the timeline, because we have a social studies teacher that makes a timeline for us and that was a neat connection to our life. We also liked the way Miss Agnes made reading and writing fun for the children. We thought the best part of the book was the ending. We were so excited when Miss Agnes came back to the village school. Your book has made us really think and we now have a lot of questions. We were wondering if you could help us answer some of them. First, we would like to know why Miss Agnes only wears pants. We also would like to know if the part about the men kicking the women when they asked them to dance is really true or is something that you made up. Another thing that we would like to find out is how you came up with the character, Bokko. The last things have to do with the ending. We are wondering why Miss Agnes came back and we want to know if the cat in the school (at the end) is hers or just a stray. We hope to hear back from you soon. PS- Maybe we could even Skype with you some day. This was a great letter! I love hearing about the parts people like. Here are some answers: It’s cold in the winter in Alaska, and any sensible woman would wear pants! At the time the book takes place most of the village women didn’t wear pants, but they had thick stockings and wool socks and tall mukluks instead. Women in that time were beginning to wear pants a lot, but Miss Agnes’ mother probably never dreamed of such a thing. I myself never would have been allowed to wear them to school, though I lived in jeans the rest of the time! Everything in the book is true..the dances at Koyukuk always included the circling and the kicking..I’ll try to find my picture of a village dance for you. Bokko jumped into the book because at the time I was studying sign language because the next year I was to have a student who was deaf. Like Miss Agnes I was TERRIBLE at it! I had the little deaf girl come into class for half an hour every day to teach my students sign language and they picked it up immediately. But best of all was the little boy who is Charlie Boy in the book..(everyone in my books is based on someone real)..he was totally brilliant at signing. No teacher would as to know why Miss Agnes came back, because teachers know she came back because she loved those kids, and the job wasn’t finished. There’s a sequel to Miss Agnes that tells more about the cat! Your letter is a delight to me.. I pinned your letter on the wall next to my computer to give me inspiration ..thank you a thousand times.